Mosbeau Placenta White All-In-One Facial Cream is infused with more whitening and moisturizing ingredients for that long-lasting evenly fair skin. 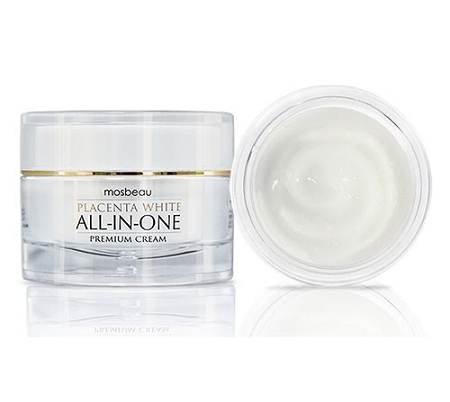 Moisturize and more with the All-in-One Facial Cream with its combined effects of facial lotion, beauty essence, moisturizer and sun block. You’ll never run out of reason to be at your most beautiful. - Now Get the benefits of skin-whitening, anti-aging, moisturizing and UV protection in one product. - Let your skin be nourished and rejuvenated with Dipotassium Glycyrrhizate and Ubiquinone that serves as potent antioxidant properties. - Look Years younger with great moisturizing ingredients like Hydrolyzed Collagen and Hydrolyzed Elastin. - Protect With Butyl Methoxydibenzoylmethane and Sericin for UV protection. - Be young, radiant and fair with Horse Placental Protein an effective skin-whitening, anti-aging and skin-nourishing ingredient. - Improve your skin problems by controlling your skin allergies & inflammation with Glycyrrhizinate 2K. 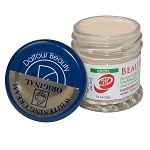 - Unique gel type texture will achieve a lighter and smoother consistency that is easily absorbed by the skin. - Non-sticky and effective for all skin types. - Perfect Base, make up blends easily and smoothly to your skin, so you’ll get a shine free matte finish. Placental Protein is a popular skin-whitening agent in Japan. Recognized as an exemplary ingredient that visibly whitens skin, removes wrinkles and fine lines, detoxifies the body and speeds up skin cell renewal. Horse Placental Protein is a more effective skin-whitening and skin-nourishing ingredient than Pig Placental protein. While, Marine Placental Protein is patented by Japan government as an effective ingredient in skin-whitening, anti-aging and skin renewal. A component that cells use to produce energy your body needs for cell growth and maintenance. It forms a film on the surface of the skin making it smoother and softer. Creates a protective film on the skin to block pollution and harmful UV rays. After washing face, lightly pat face dry leaving the skin still a bit damp. Scoop an ample amount of cream and massage all over your face and neck using an upward, circular motion. Pampaputi ng balat, Acne Care, at Anti-Aging Products. Skincare at body image ay maaaring maging isa sa mga biggest concerns para sa isang tao ng anuman ang edad. Sa mundo kung saan we want to look our best, ang pakiramdam na hindi satisfied sa ating skin and body ay isang common complaint. Kung ikaw ay nagsusuffer mula sa hindi pantay na pigmentation ng balat, acne, unwanted body weight o nais lamang maglighten ang iyong current skin tone, we can help! We know na ang beauty at health ay pinaka importante to women and we want you to feel comfortable and look great! We offer great prices sa mga authentic products brought to you straight from the source. Sa Flawless Beauty and Skin we pride ourselves sa pagbibigay sa inyo ng authentic Dalfour Beauty cream, soap at lotion, as well as, Mosbeau at Relumins skin whitening, bleaching & anti-aging pati na rin ang maraming iba pang mga produkto ng skincare. Ang Dalfour Beauty Cream at ang iba pang product ay base sa fruit at seaweed extracts. Ito ay safe at natural way upang maglighten ang iyong balat. 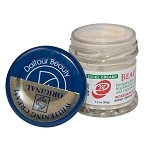 Ang Dalfour Beauty cream, soaps and lotions ay considered to be some of the finest skin whitening products sa market. Madali at ligtas gamitin, you'll find yourself with a perfect complexion in no time. Ang Dalfour Beauty cream ay epektibo sa mga skin blemishes katulad ng: acne scars, yellow spotted skin, black heads, wrinkles and freckles. Ang Gold Seal formulas namin ay incredibly effective kapag ginamit for skin whitening at wala itong hydroquinone or mercury content. Ang Dalfour Beauty cream na featured sa site na ito ay 100% authentic. Ini-import ang aming mga produkto directly sa Kuwait at nagfeature ng 14 day money back guarantee. Ang Relumins line of skincare, beauty and weight loss products ay manufactured sa eksaktong specifications and must meet rigorous safety standards bago maging available sa publiko. In addition sa pagiging gawa sa world-class manufacturing facilities, ang Relumins products ay naglalaman lamang ng mga finest ingredients mula sa mapagkakatiwalaan, world-wide sources. Lahat ng Relumins products ay guaranteed hydroquinone-free, hindi tested sa animals, 100% free sa harmful heavy metals at no hidden ingredients. Ang Mosbeau Placenta White ay ang number one skin whitening product sa Asia. Ngayon nag ooffer kami ng full line ng Mosbeau skin whitening, lightening, bleaching & anti-aging products dito sa USA. 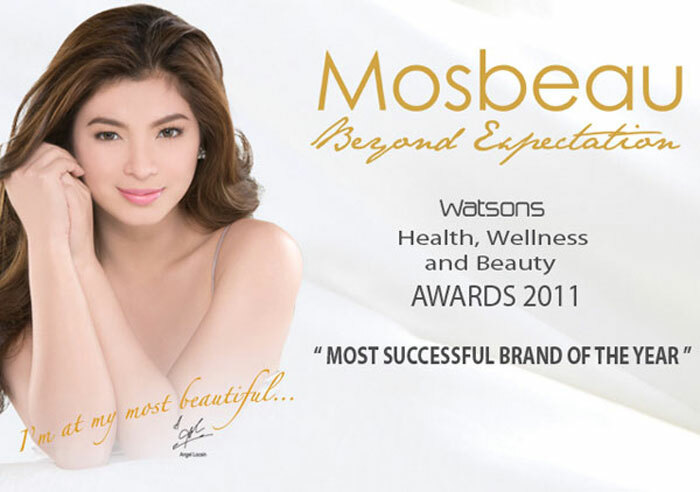 Nag bebenta kami ng wholesale and retail at competitive prices, so whether it is the Mosbeau all in one creams, soaps or lotions, the Mosbeau Platinum Evolution Whitening, Anti-Aging, UV-Protection for Face & Body or the Mosbeau Advanced Whitening Tablets, we have it. Ang Mosbeau ang best skin whitening kahit saan! Aming pinagmamalaki ang pag carry ng complete line of acne treatment products and acne scar products na proven safe and effective. These are just a few of our best selling and most popular brands. Let us help you choose the best products that are natural and effective! After all flawless beauty and skin is our business! Copyright Flawless Beauty Philippines. All Rights Reserved. eCommerce Software by 3dcart.